Admission is free. Donations are requested from those who are able. The Haven at Skanda will provide all treats for the animals. When Jesus was born, he entered the world welcomed by the innocents: the pure, beautiful animals who surrounded him with love in the barn. Anyone who has visited the barns at Skanda already knows the soft, pure feeling of walking through the space where the animals live: their innocence and purity creates a softness and sweetness that can be felt and is incredibly therapeutic and inspiring for everyone. The animals offer themselves as examples of what we, too, can become, and are such generous reminders of the purity and love we celebrate at Christmas. 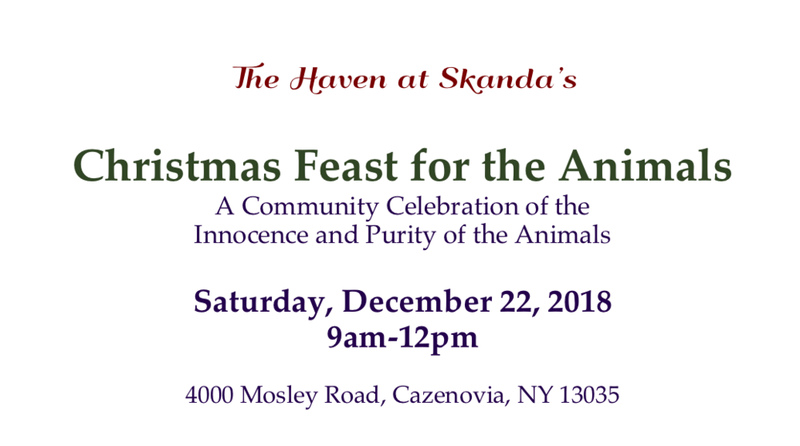 This year, on December 22, Skanda will welcome the community for a Christmas Feast for the Animals, a day to truly celebrate and revere the animals at Skanda and all over the earth for the special qualities they hold so beautifully for us, an example of what we too can become. Visitors can feed the animals special treats, groom them, play with them, bring them gifts, and simply enjoy and celebrate their amazing presence and brilliance. Tickets are free, and reservations are encouraged through Eventbrite through the “Reserve Tickets” button above.